I seem to be in the mood for vintage fragrances this summer, whether they date to the 1980s or much earlier. This week, I spent some time with Fabergé Straw Hat, a scent that was originally released in 1938 and discontinued in 1976, after being offered every spring and summer as a limited edition. I only became acquainted with Fabergé's other fragrances a few years ago. Aphrodisia is still my favorite, but Straw Hat feels is more seasonally appropriate this week! Fabergé (the cosmetics brand, that is — not the jewelers to the Russian imperial family!) was founded in 1937 by the Russian-born businessman and philanthropist Samuel Rubin, who sold the company to a competitor in 1963. Fabergé continued to release new perfumes and toiletries, was subject to further mergers over the years, and had most of its products discontinued under Unilever's ownership in the 1990s. I remember the magazine ads for Babe (1977) from my youth, and the Brut men's collection is still available. Straw Hat's composition reportedly features top notes of lemon, lavender and geranium; middle notes of rose, violet, heliotrope and patchouli; and base notes of vanilla, musk and sandalwood. I've been wearing the "Cologne" concentration; a Straw Hat Parfum was also available, as were matching dusting powder, soap and "bath perfume." From what I can tell in vintage ads, the packaging was playful and it changed from time to time, often incorporating straw-weave patterns and textures. My small amount of Straw Hat has probably been around longer than I have, so I'll excuse the syrupy turn of its top notes. That's just due to age, and once Straw Hat has developed on my skin for about twenty minutes, that "tarnished" aspect fades and I can smell the rest of the fragrance. The citrus notes may not be as clear as they once were, but the violet is still a central motif. It's a sweet violet note, but not candied — it's almost rich, and a touch woody. The heliotrope adds to the sweetness, and there are other notes to keep things from getting too cute: a very wearable patchouli, plus a honeyed green-grassy note. Considering its "Cologne" (Eau de Toilette?) concentration and its age, Straw Hat has decent staying power on my skin. Its dry down includes some powdery woods, leaving me with the impression that Straw Hat is pretty sophisticated for a summer-themed fragrance with breezy, colorful advertising. Of course, tastes have shifted since Fabergé's heyday in the 1950s and 1960s; Straw Hat very likely seemed like a more casual alternative to the full-bodied chypres and aldehydic florals of the time. Since my own leanings are slightly old-fashioned, I'm enjoying it. I'll still turn to one of my lighter summer favorites for the really hot days ahead, but a shady bit of vintage "millinery" still feels right on a warm afternoon. How delightful! Perfect as a first perfume for a young girl, by the sound of it. There is something very innocent and homely about ‘straw hat’. Faberge would have been getting plenty of competition from Avon for that market, I expect. By the way Jessica, after your recent review of Loulou, I re-tested it and am now the proud owner of a 30ml FB. I’d avoided Loulou for years, but once I realised that one just has to push on through those top notes, I’ve learned to enjoy it. Many thanks for your review. I agree…”straw hats” do have those connotations! Some of the other Faberge scents were advertised as being so sultry — Tigress! 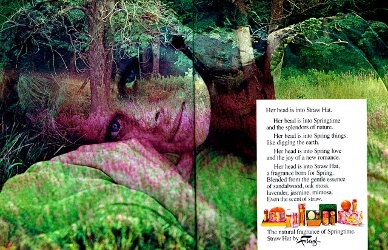 — but this one seems to have been aimed at younger girls, and then they made it into a “flower child” sort of product! I’m so glad you’ve done a LouLou turnaround like I have! Once those topnotes soften, it really is charming! I remember Straw Hat being available–my child-brain didn’t work out that it was seasonal–but I don’t have a scent memory of the fragrance. The one I remember most was Tigress, even though my child-nose didn’t really appreciate it then. 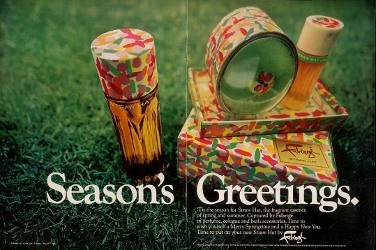 How I’d love to smell all the old Fabergés again! I think I might get on with them better now. Thanks for your review, Jessica. Me too — I wish I could travel back to the drugstore perfume shelf of my youth! So many good options that don’t exist anymore or have been reformulated. And Avon, too — my grandmother wore Avon perfumes for everyday (she saved her Caron Bellodgia for special occasions, I believe!) and she always smelled good. Me three, although in the case of Faberge it would be smelling some of them for the first time, because apart from Brut, I don’t think Faberge was distributed much where I live. I’d love to smell Tigress. Tuvache is another brand that I know only by reading about it. Jungle Gardenia sounds amazing! Really enjoyable, Jessica, thanks. I loved Tigress and Woodhue. Sadly I find both the Faberges and Danas didn’t hold up well over time, maybe both because they were inexpensive, and splash-type bottles that were easily contaminated. I’ll need to try an Ambush spray sometime. Oh man, thanks for this memory trigger, Jessica! I thought I had remembered all of the perfumes from my childhood, but I’d forgotten this one. I can feel the neurons firing and I’m getting a “glimpse” of the scent and I can remember being in summer clothes in the drugstore and spraying this with abandon. I don’t think I owned it. It has occurred to me quite frequently that we don’t have the vocabulary (in English, anyway) to express a lot of things regarding scent. In this particular case, trying to remember how Straw Hat smelled is similar to having a word on the tip of your tongue.